The Beatson Oncology Centre, now known as the Beatson West of Scotland Cancer Centre, is the UK�s most advanced non-surgical cancer centre, with facilities which rival the top cancer centres of Europe. It officially opened at its new location within the Gartnavel hospital site in February 2008 in the West End of Glasgow, serving a population of 2.8 million people. It is staffed with highly-trained, professional and dedicated experts in cancer care and boasts cutting edge technical equipment coupled with a relaxing and therapeutic environment in which patients can receive the very best cancer treatment. The BWSCC is also a teaching facility and houses the cancer-related academic units of the University of Glasgow. The centre also recruits for a large number of clinical trials in the field of oncology and plays a major part in clinical research and analytical services, while contributing to cooperative oncology groups throughout Britain and Europe. The Sandyford Hotel can be found between the West End of Glasgow, where the Gartnavel General Hospital is located, and the City Centre, making it a perfect choice for visitors to Glasgow who need accommodation near Beatson Oncology Centre. We offer our customers unbeatable value on bed and breakfast accommodation; our rooms and cheap and affordable, but we don�t cut corners when it comes to quality. All rooms are en suite, have Wi-Fi access and welcome visitors with tea and coffee-making facilities. There is someone at reception to greet you at any time of day or night. Reserve one of our 55 comfortable 3* hotel rooms offering B&B accommodation in the heart of Glasgow. Our staff will be delighted to take your call and answer your query. Alternatively you can use the online booking form on this site to make a reservation. 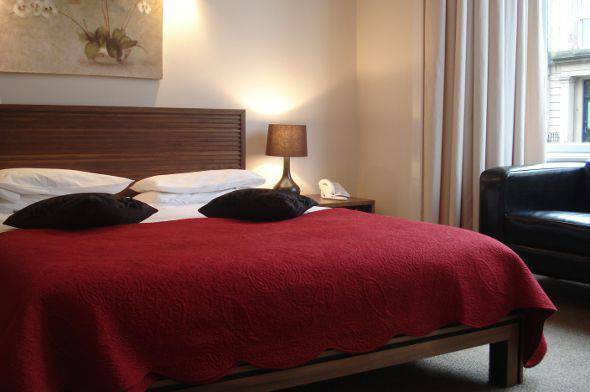 For conveniently located hotels near the Beatson Oncology Centre, you can�t do better than The Sandyford Hotel.